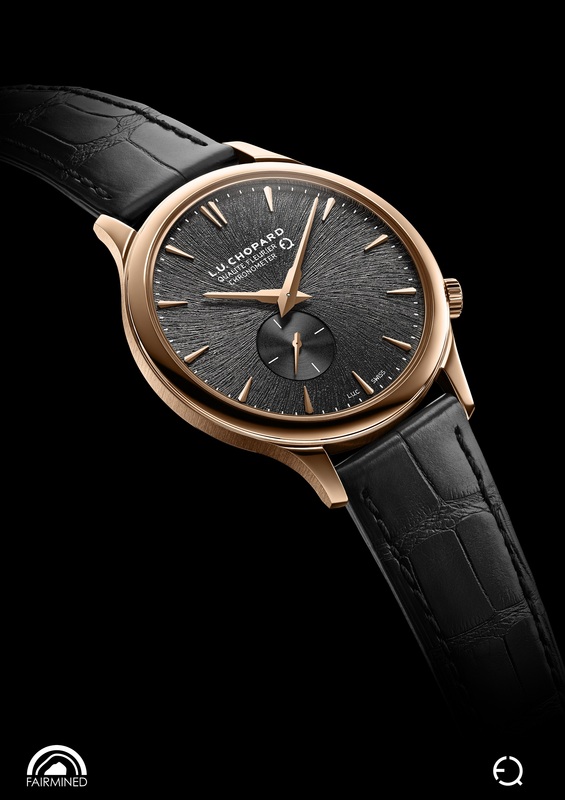 For Baselworld 2017, Chopard is launching a new limited-series L.U.C watch crafted in ethical rose gold. The L.U.C XPS Twist QF Fairmined is an ultra-thin model mingling ethical, aesthetic and technical qualities. The first ever watch from the Chopard stable to use Fairmined gold was the Chopard L.U.C Tourbillon Qualite Fleurier way back in 2014. But what exactly is Fairmined gold? Well, in 2013, Chopard embarked on a long-term project called “The Journey to Sustainable Luxury” which began with an agreement with the South American NGO Alliance for Responsible Mining (ARM). Chopard became the first watch and jewellery company to support gold mining communities towards achieving Fairmined certification. The Fairmined label ensures that gold is extracted in a responsible manner by small-scale mining communities, in which both miners and the environment are properly treated and that the buyers pay a premium in addition to the fixed gold price that is duly reinvested in community projects. These communities thereby enjoy improved living contributions and a fairer return for their work. To guarantee the traceability of the Fairmined gold used in-house, Chopard has set up a specific operational protocol in its Geneva workshops, where Fairmined gold is never mixed with other gold alloys and even the waste is dealt with separately. This production process based on segregating the different gold types was used to make the case of the L.U.C XPS Twist QF Fairmined in ethical, traceable and certified 18-carat rose gold. The case of the L.U.C XPS Twist QF Fairmined measures a contemporary 40 mm in diameter and a slender 7.20 mm in thickness. While the case middle is satin-brushed, both the bezel and case back are mirror-polished. 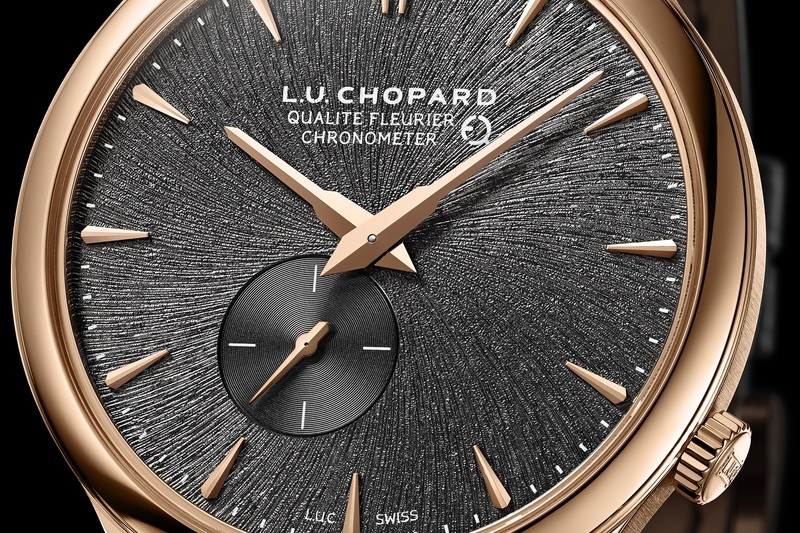 The positioning of the crown and small seconds sub-dial contribute to the unique flair of the watch – both are off-centred at 4 and 7 o’clock, respectively. 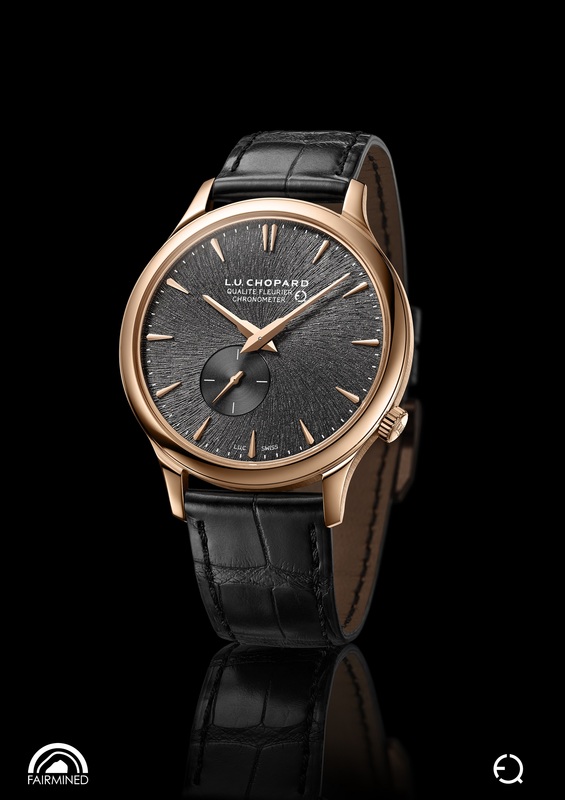 The dial design, however, is what truly makes the L.U.C XPS Twist QF Fairmined special. It has a stamped sunburst texture featuring a slate grey colour that stands out against the rose gold case. 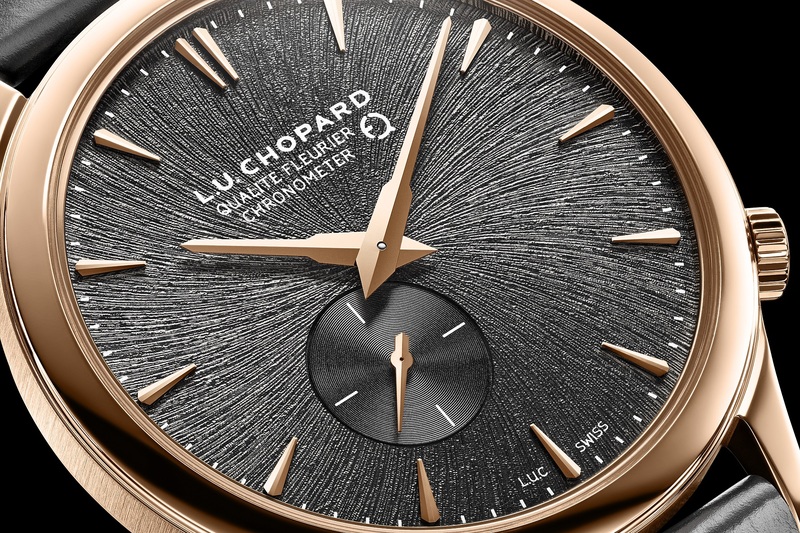 According to the manufacturer, this dial effect is inspired by the raw composition of gold nuggets extracted from mines. The dauphine-style hour, minute, and second hands are also crafted from the same Fairmined gold and matches beautifully with the faceted hour indices. The L.U.C XPS Twist QF Fairmined has successfully undergone all the testing stages of the Fleurier Quality Foundation certification process – the most demanding in the watch industry. This certification relates to the precision of the movement, its reliability, its durability and the quality of its finishes. Upstream of these rigorous tests, the Fleurier Quality Foundation regulations stipulate that the entire watch – including movement and external components – must be produced in Switzerland. The watch is also Swiss Official Chronometer Testing Institute (COSC)-certified and is therefore awarded the chronometer title. The L.U.C XPS Twist QF Fairmined is powered by the self-winding calibre L.U.C 96.09-L. The 172-part, 29-jewelled movement has a commendable 65-hour power reserve running off two barrels while operating at a modern 4 Hz beat rate. The finishing is evidently superlative: deep Côtes de Genève on the bridges, chamfered and polished edges, tight and even perlage on the baseplate, polished screw heads – it is everything you’d expect from a Fleurier Quality Foundation-certified movement. Produced in a limited run of 250 pieces, the L.U.C XPS Twist QF Fairmined comes with a hand-sewn matt black alligator leather strap with cognac-toned alligator leather lining. The watch is priced at USD18,480.